Black Lives Matter Activist Shaun King took to Twitter to deny the existence of a war on cops and to attack former Alaskan Governor Sarah Palin. King also claimed that the use of the phrase “call off your dogs” by Sarah Palin was “dehumanizing” to Black Lives Matter, since King claim it compared Black Lives Matter activists to animals. One front for Black Lives Matter’s War on Cops has been constant, dishonest media attacks against the police that have created an antagonistic and hostile environment for law enforcement. Although some witnesses state that Brown held his hands up at shoulder level with his palms facing outward for a brief moment, these same witnesses describe Brown then dropping his hands and ‘charging’ at Wilson. The “Hands Up, Don’t Shoot” was repeated endlessly by Black Lives Matter activists, creating the false impression that Brown was an innocent man shot by a rouge white police officer. I’m not going to parse evidence or make some complex technical argument that Michael Brown did or didn’t have his hands up. To me, it doesn’t matter if he did or he didn’t. It never has. The shooter — identified as Ismaaiyl Brinsley — boasted about wanting to murder cops in the hours before he ambushed the officers outside the Tompkins Houses in Bedford-Stuyvesant about 2:45 p.m.
“I’m putting wings on pigs today. They take 1 of ours … let’s take 2 of theirs,” Brinsley, 28, wrote on Instagram, alongside a photo of a silver handgun. He also included three hashtags: ShootThePolice, RIPErivGarner (sic) and RIPMikeBrown. 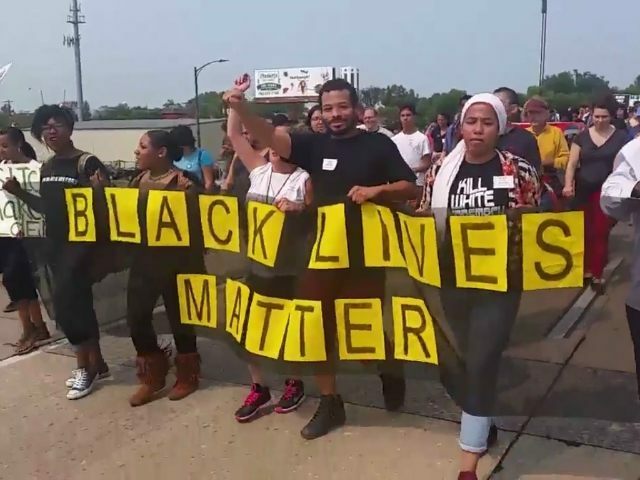 It wasn’t just Ismaaiyl Brinsley who referred to the police as pigs: following the murders, Black Lives Matter activists taunted the police in their street protests and chanted “Pigs in a blanket, fry ‘en like bacon!” as shown in this YouTube video. After Texas Deputy Sheriff Darren Goforth was executed last month, once again Black Lives Matter activists took to the street to call the police pigs. As Breitbart News reported, immediately following Goforth’s murder, Black Lives Matter were dehumanizing police again. Shaun King and other Black Lives Matter activists are well aware of this history and of the other recent murders connected to their race war rhetoric. Just don’t expect the mainstream media to hold them accountable for it.